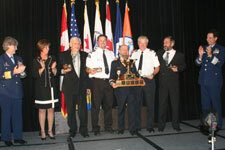 Team Canada won the International Search and Rescue Competition held in Halifax, Nova Scotia on September 30 and October 1. The competition was hosted by CCGA Maritimes. Twelve teams representing the Canadian and U.S. Coast Guard Auxiliaries participated in various events ranging from dewatering pump operation to line heaving and from chart work to search planning.